Maggie’s Music record label is excited to present another holiday classic in a succession of national bestsellers that includes: Merrily Greet the Time, A Scottish Christmas, Ancient Noels. 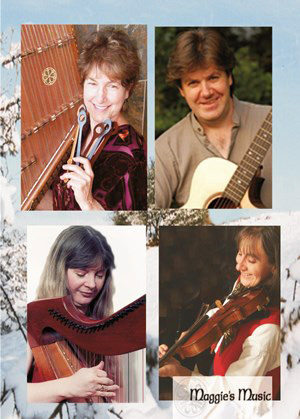 A multi cultural mix includes Maggie Sansone on hammered dulcimer, Andrea Hoag on fiddle, from Scotland, Sharon Knowles on Celtic harp and, from Ireland Patrick Egan on guitar and vocals. Heartfelt and uplifting, a perfect holiday recording suitable for all ages. Christ Church , West River (www. christchurchwestriver.org), Connie McKenna, Richard Crenshaw and the staff at Maggie’s Music; Patrick Egan thanks Tony Small for the song I Wonder As I Wonder.